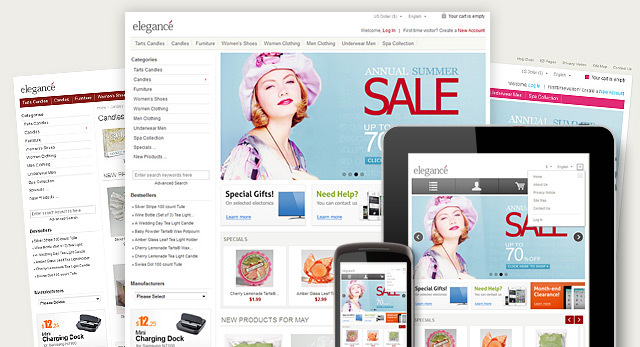 Let me present our another great responsive Zen Cart theme with 5 color variations included. Different types of top navigation, slideshow and carousel banners, category dropdowns on the sidebox and top navigation and much more features. See some features and settings of the theme on the example of our another Business Zen Cart template with illustrations. You can easily set 3 or 2 column layout via Zen Cart admin area. All Zen Cart admin features are stayed untouched for all our Zen Cart themes, so you can change all the elements after the template installation by the same way as you can do it via default Zen Cart admin area. Only one setting parameter is disabled for the theme in the admin area (column width) due to the fact the responsive feature requires a special layout, so we created a new layout that is based on “div” HTML tag, not table. Columns width is defined automatically when you change 3 or 2 column layout.